Posted February 8, 2019 by Josette Farrell in News. 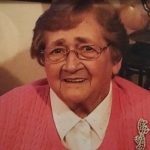 The death has occurred of Annmarie Broderick, (nee Murray), Keekill, Headford, Co Galway. Formerly of The Salthill Hotel and Cregg Castle, Galway, February 7th 2019 surrounded by her loving family in the wonderful care of the staff at Galway Hospice. Annmarie, sadly missed by her heartbroken husband Pat, loving daughters Alexandra and Karen, brothers James, Dennis (predeceased), David and Michael, grandchildren Ella, Jude, Dylan, Joel, Aoife and Líadan, sister, sons-in-law, nieces, nephews and friends. Reposing at Ryders Funeral Home, Headford, Co Galway from 4pm until 6pm on Saturday 9th February. Removal at 7pm to her home in Keekill. House Private. Burial in the Old Cregg Cemetery on the grounds of Cregg Castle, Corrandulla at 1.30pm on Sunday 10th February. Family flowers only by request. Donations, if desired, to Galway Hospice. R.I.P. Maureen COMMINS, Kiniska, Claregalway.